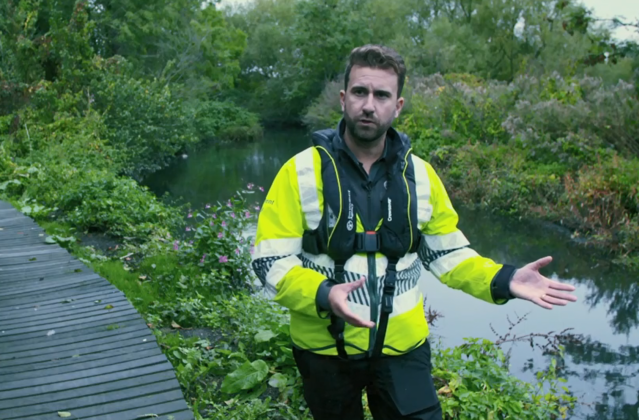 Last week BBC documentary Defenders UK looked at the Environment Agency’s record prosecution of Thames Water, and now two further episodes have highlighted our work investigating further water pollution incidents in Lancashire and London. Aired on BBC One, Defenders UK follows the work of enforcement officers from various agencies as they work to protect the public, with episode eight looking at our work to investigate Tesco over a pollution incident in July 2014. The programme includes interviews Andy Goodwin and Kevin Nash, who helped carry out the investigation, and Toby Willison, the EA's Executive Director of Operations, explaining how the worked along other bodies such as Lancashire County Council to bring asuccessful prosecution against Tesco resulting in fines totalling £8 million. Episode nine, aired on Thursday, focused on the work of EA officer Mathew Reed to investigate luxury coach firm Symphony Chauffeurs after they emptied toilet waste into public drains in 2015, resulting in serious pollution to the River Crane in West London. The episode includes a reconstruction of the methods which the team used to build the case, bringing a successful prosecution which saw Symphony Chauffeurs fined £18,000 and the company’s sole director fined a further £3,000. You can watch episode 8 here and episode 9 here on BBC iPlayer. There is coverage in The Telegraph following a letter by a small group of MPs, peers, business leaders and campaigners calling on the government to stop “passing the buck” to the world’s poorest on plastic waste. The group wrote that the sight of rubbish abroad that is generated in Britain is becoming common, and called for an immediate ban on plastic waste exports to help tackle plastic pollution. There is a legitimate export market for plastics, particularly for countries that manufacture new products out of recycled plastic waste. Our regulator is in contact with countries where concerns have been raised about illegal exports. Meanwhile, we are committed to reducing the amount of waste we produce, and recycling more in the UK. The UK is committed to being a global leader in tackling the issue of plastic pollution, and to recycling more at home. While there has been a significant increase in recycling over the last 10 years, there is more that needs to be done and we will set out proposals in our forthcoming Waste and Resources Strategy. Waste and recycling must be properly managed whether it is processed at home or abroad. We work closely with the waste industry, Environment Agency and local authorities to safeguard the environment. We also work globally, helping countries to improve their waste management through international aid. Far from the so called dumping of waste it is a way of supporting the economy. The UK is committed to being a global leader in tackling the issue of plastic pollution and has already introduced a world-leading ban on microbeads in rinse-off personal care products, taken over 15 billion plastic bags out of circulation, and announced plans to ban plastic straws, stirrers and cotton buds. We remain global leaders on tackling plastic pollution entering our oceans, particularly through the Commonwealth, but also the UN, G7, G20 and regional partnerships.